The STP01 is a sensor for very accurate measurement of temperature versus depth (also called "temperature gradient") in the soil. A heating wire offers the possibility of self-testing, increasing the level of quality assurance. An experimental option is to determine soil thermal conductivity as a function of depth. See also the scientific section on non-steady state probe science. The measurement of soil temperature profiles has many applications, particularly in determining soil energy balance. STP01 contains 5 thermocouples, tc, (at 2, 5, 10, 20 and 50 cm depth) and one reference Pt100 temperature sensor (at 50 cm). The key item in the design is the central copper-nickel (CuNi) wire. By having the reference tc junction in the sensor and only measuring differential tc voltages (relative to the reference tc junction at 50 cm), the gradient accuracy is record breaking (down to +/- 0.02 degrees C) and cabling can be simple all copper (Cu) wire. The reaction of the tc's to sudden heating (tc pulse response) is a test for sensor performance in the inaccessible environment. 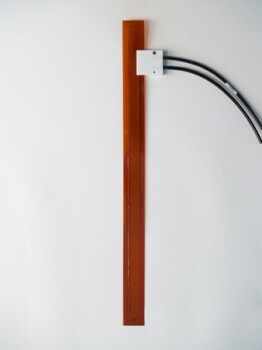 sensor to logger cabling is all copper; easily extendable. easy quality assurance & servicing: self-test is possible by heating and looking at the pulse response, saving servicing time. When using the heater, the tc pulse response can be used to calculate soil thermal conductivity at 3 depths; 5, 10 and 20 cm. The well established thermal needle or non-steady-state probe technique is applicable. For more theory on this method, see ask for the Hukseflux TP02 manual. (T = A.ln(t) +B, with T temperature, t time, A a function of geometry, power and thermal conductivity). The possibility to perform this measurement is an experimental option and the measurement accuracy is not specified by Hukseflux. Solutions for measurement and control: See the STP01 manual or inquire at Hukseflux. Example programs for Campbell Scientific CR10X and CR1000 is available.